With data security and privacy becoming an alarming issue while dealing with the data-hungry companies, ZeroPhone seems like a sigh of relief. ZeroPhone is a Raspberry Pi-based, open-source, Linux-powered handset that has been launched as a project on Crowd Supply; we’ve already told you about the phone in the past. The device promises no carrier locks, no pre-loaded apps and good riddance from harvesting of data without users’ knowledge. The phone will be based on Raspberry Pi Zero, the ESP8266 Wi-Fi module, and an Arduino microcontroller. What makes ZeroPhone stand apart from the other conventionally available smartphones is the presence of a mini-HDMI port and a full-size USB 2.0 port. Apart from these, the phone would also feature Wi-Fi connectivity option and a 3.5mm headphone jack. As far as the drawbacks are considered, the ZeroPhone will have a smaller screen size — 1.3-inch 128×64 OLED display and will be initially launched with 2G SIM connectivity with 3G and 4G options available gradually. He also added that the phone could be modified and repaired easily as it will be designed from the widely available components. The technically astute crowd will be able to use the phone to its maximum potential. Technically proficient users can attach additional components such as IR receivers, Pi’s 5 and eight-megapixel camera on the phone’s electronic board. The phone will also allow users to SSH into the device for remote access that would enable them to run different Linux-based software on the phone. Additionally, users can also attach a keyboard and mouse with the USB 2.0 port. However, Pi Zero’s single-core processor isn’t meant for heavy graphics usage. 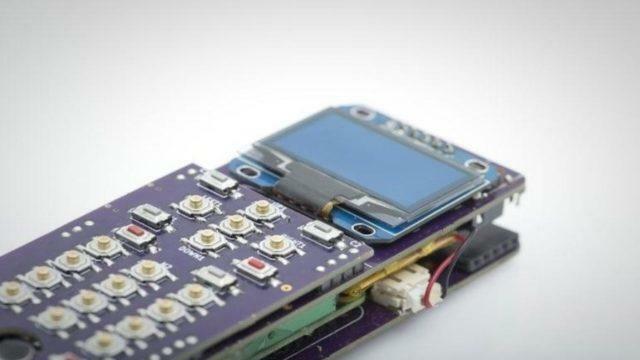 The ZeroPhone project has been labeled as “coming soon” and is expected to cost around $50.